Beer has been a passion of all kinds of humans for millenniums, and its presence is strong and celebrated in Orlando! No matter which part of town you’re in, you won’t be far from a fabulous brewery—after your first sip, you’ll already look forward to coming back. Here are some of the best breweries around—be on the lookout for these names! The name says it all! This is Orlando’s downtown brewery—it’s just slightly south of downtown proper, on Atlanta Avenue, easily accessible from I-4. Built around a quality “beer garden" style, it’s perhaps the most popular brewery in Orlando! The beer is locally made and top-notch—even non-beer drinkers have reported conversion experiences here! That may also be thanks to the fabulous staff who are friendly and knowledgeable. It’s worth noting that Orlando Brewing does not serve any food, but has a delivery system set up with other restaurants. With some of the best beer around, it’s not a bad trade-off! It sounds like something out of a TV show, and well, it is! On Exposition Boulevard in Universal Orlando, you can enter the delightful Duff brewery of The Simpsons fame. It’s a great place in the park to crack open a cold one, while The Simpsons play episode after episode on the TVs. There are non-alcoholic drinks here too, making Duff a very kid-friendly Orlando brewery. Don’t forget to pick up some authentic Simpsons merchandise while you’re here! Conveniently located near Disney World off Palm Parkway, Sea Dog is another hangout that takes beer seriously. Named after a water-loving pup who once guarded the brewing beers, this chain specializes in English-style drinks. However, they don’t slack at all in other aspects of their Orlando brewery: customers adore the food here as much as (possibly more!) than the beer. Plus, the prices are very reasonable at Sea Dog—unlike many restaurants (we regret to admit) near Disney World! Enjoy craft beer inside and artisan food market to live music. What will entice your taste buds - A Citrus Kicker IPA, the Workaholic American Pale Ale, or perhaps a Cloud Chaser brewed and cellared German Style? Take a tour and pick your favorite among many more. There are delicious eateries for everyone in your party too - Pizza, sushi. burgers, wings, vegan, and yes, chocolate. Located in Historic Downtown Winter Garden, the Crooked Can Brewing Company makes for a unique and relaxing place to hang out. You can’t talk about Orlando Brewing without mentioning Ocean Sun! This is just a short way east by southeast of downtown, on the corner of Curry Ford Road and Crystal Lake Drive. This brewing company has frequent customers thanks to its atmosphere as well as their quality brews. The delicious beers are served by a friendly staff who treat their customers fabulously. Plus, the area is dog-friendly, so long as you have a leash! Ocean Sun is ideal for stopping by for a drink and playing a game with some friends. 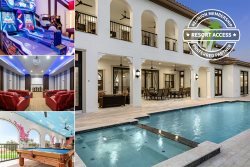 Brew Up Some Fun with Reunion Vacation Homes’ Vacation Rentals! Whether you’re a family or a group of friends, our offerings include has a dream home for you! Browse our properties or call us at 1-855-453-5400 to learn more!